The days are getting shorter, the leaves are in need of raking, and there’s a distinct chill in the air which can only mean one thing: time for CHILI! 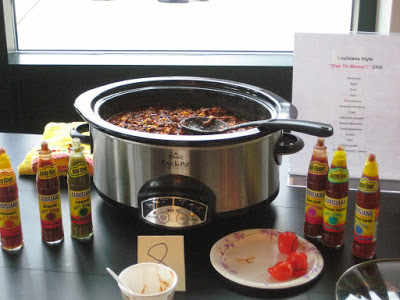 On Thursday, Nov. 6th from 3-4 pm the library is happy to present the 7th Annual Library Chili Cookoff! There will be categories for best vegetarian, judge’s choice, and people’s choice. In addition to the chili cookoff, some chefs will also compete in the Fantastic Cornbread Hootenanny. Come join us in the front Tower Room to eat FREE chili and cornbread and vote for your favorite! This entry was posted in Uncategorized on October 30, 2014 by Daniel Selicaro.